WASHINGTON (AP) — She uttered just 80 halting words. But her presence was powerful. 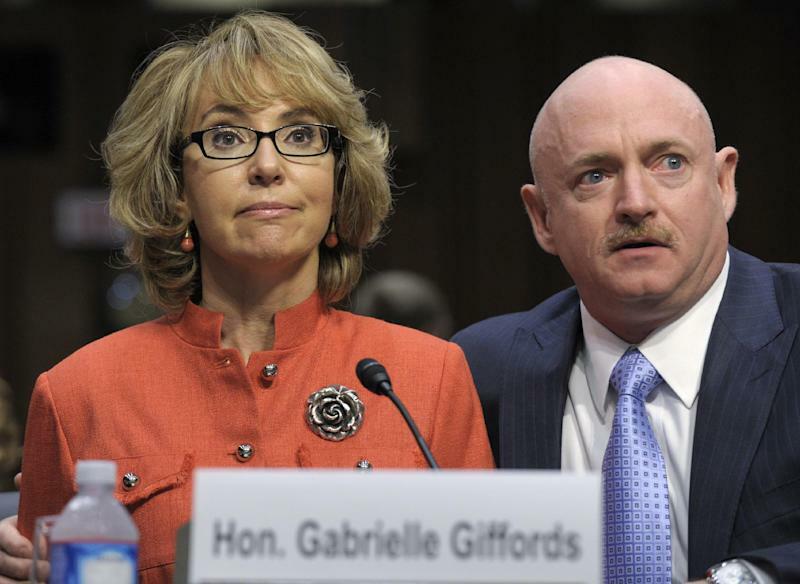 Former Rep. Gabrielle Giffords, shot in the head by a Tucson gunman in 2011, opened the Senate Judiciary Committee's hearing on gun violence in dramatic fashion Wednesday. "OK," she began, steeling herself before a packed yet hushed committee room. "Speaking is difficult," she continued, pronouncing each syllable with deliberation. This former congresswoman, once blessed with a politician's easy gift of gab, spoke in a high pitch, her voice almost childlike. "I need to say something important. Violence is a big problem. Too many children are dying. Too many children. We must do something. "It will be hard, but the time is now. You must act. Be bold, be courageous, Americans are counting on you." Giffords, her every movement labored, punctuated her conclusion by raising a clenched fist to her chest. Her husband, former astronaut Mark Kelly, gently guided her from the table, then returned to fill out the picture. "Gabby's gift for speech is a distant memory," Kelly said. "She struggles to walk and she is partially blind. And a year ago, she left a job she loves, serving the people of Arizona." Giffords had been working on her statement for the past week, but didn't decide to go through with delivering it until Tuesday night, according to Pia Carusone, her former chief of staff. Her appearance at the witness table offered rare insight into her condition. Her family has closely guarded her privacy and the details of her impairment. She continues to undergo physical and speech therapy every week. She is right-handed, and the shooting completely paralyzed that arm, so her speech therapist wrote out the testimony that Giffords read. "This is the first time she spoke in front of that many cameras and in that sort of stressful environment, but she's made such progress recently that she felt she was up for it," Carusone said. "This is not something she could have done a year ago." Democratic Rep. Debbie Wasserman Schultz of Florida told CNN it takes her good friend "a tremendous amount of rehearsal and practice" to utter even a few sentences. "What she did today was remarkable," Wasserman Schultz said. "You could hear the emotion and the power behind the statement she was making because she feels so strongly about this." After the hearing, Giffords and Kelly met privately with President Barack Obama at the White House. Giffords has made only a few public appearances and interviews since the January 2011 shooting, including reciting the Pledge of Allegiance at the Democratic National Convention and casting a single vote in August 2011 on legislation to raise the federal debt limit. She resigned her seat in Congress a year ago to focus on her recovery. Giffords and Kelly, both gun owners, have formed a political action group called Americans for Responsible Solutions that is promoting universal background checks for gun purchasers and limiting the size of ammunition magazines. Gun control is an issue that really hasn't been debated in Congress for more than 10 years. It rarely gets an airing and engenders strong emotions. And so it was that both sides did their all to ensure maximum impact from Wednesday's hearing. 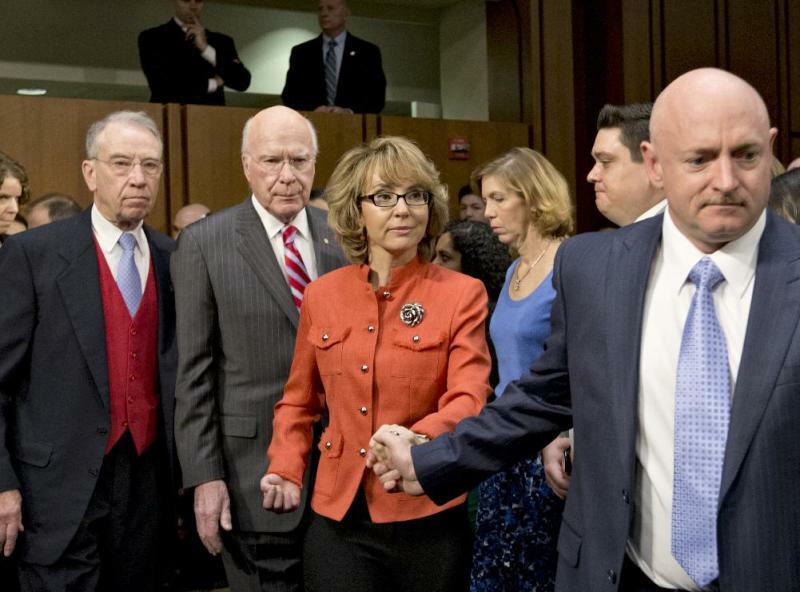 Giffords was clearly happy to do her part.